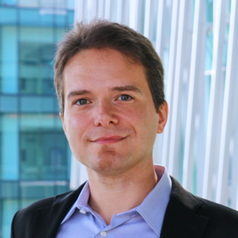 Dimitri Perrin is Senior Lecturer at the Queensland University of Technology. Prior to joining QUT, he worked as a FPR Fellow in the Laboratory for Systems Biology (RIKEN, Japan) and as an IRCSET Marie-Curie Research Fellow with the Centre for Scientific Computing & Complex Systems Modelling (Dublin City University, Ireland) and the Department of Information Networking (Osaka University, Japan). Dimitri Perrin holds a Master’s Degree (Diplôme d’Ingénieur) in Computer Engineering from ISIMA (Aubière, France), a M.Sc. in Computing from Université Blaise Pascal (Clermont-Ferrand, France), and received his Ph.D. in Computing from Dublin City University (Dublin, Ireland).